Polyphenols are among the most precious components of olive oil, and determine its typical fruity aroma, its tang, sharp taste, besides protecting the oil from decay and developing a powerful antioxidant action in the human organism. The actual concentration of polyphenols in the olive oil depends on the olive cultivar, on the harvesting period, the soil characteristics and the extraction process. The higher the concentration of polyphenols in olive oil, the better its organoleptic qualities, the more suited the production process, the longer the oil can last and have beneficial effects on human health. The new Total Polyphenol (Biophenol) Test used by the CDR OxiTester has been tuned to the reference method COI/T.20/Doc. no. 29: 2009 by the Merceological Chemical Laboratory of Florence; the total olive oil polyphenol test results as obtained by the CDR OxiTester method are in good accord with the values obtained by the reference method. 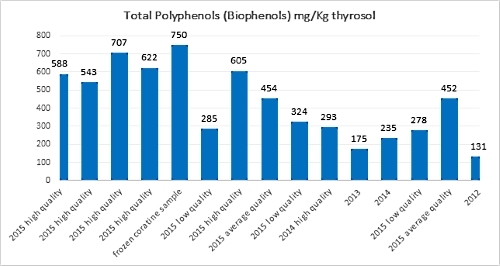 Below, the result of some test analyses performed on several extra virgin oil samples, using the new CDR method for the total polyphenol content assay. The Merceological Chemical Laboratory of Florence has recognized several advantages of the analysis system contained in the CDR OxiTester versus the official method. The new CDR FoodLab® method, used by the CDR OxiTester testing system, is a visible-light spectrometry method in which reducing substances react with a colored reagent, placed in pre-filled vials, thereby reducing their absorbance. This analysis is extremely simple and fast (5 minutes), the reagent is ready inside the vial supplied to perform the analysis, and to which a fixed quantity of 10 μL of oil is added; after a short wait, the color of the vial is read by the CDR OxiTester analyzer. The official method is, on the other hand, quite long and complicated, and requires sophisticated equipment and materials such as a high performance liquid chromatography (HPLC), several chemical substances of which some are dangerous, and assorted laboratory material. This is because the official method approved by the International Olive Council is based on the extraction of minor polar biophenolic compounds directly from the olive oil by dissolving them in a methanol solution, followed by a quantitative assay using the HPLC with UV detection at a peak wavelength of 280 nm. 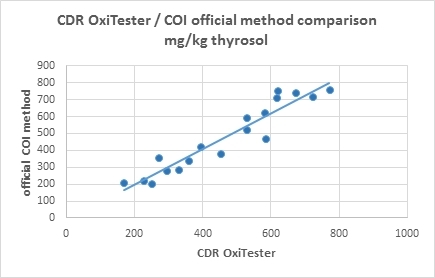 Total Polyphenol (Biophenol) Test with CDR OxiTester compared to the COI method was last modified: May 3rd, 2017 by CDR s.r.l.